Since the early 2000s, social marketing media platforms have revolutionized the way people connect with one another. Today, there are 2.3 billion active users of social media worldwide. Business owners who take advantage of the ocean-sized lead pool created by social media channels will undoubtedly reel in a boatload of benefits. Currently, the number of brands present on two or more social media platforms has surpassed 90%, and in 2016, Facebook reported reaching 50 million small business users. 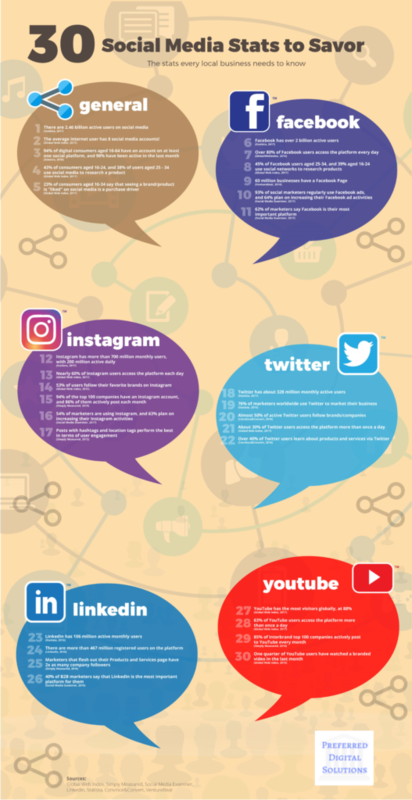 Despite this level of online presence, business owners consistently report that social media is the second most difficult marketing tactic to execute effectively (immediately behind Search Engine Optimization, AKA SEO). Business owners believe that learning how to properly utilize social media platforms is time consuming, and that their time would be better spent on other marketing tactics. Making the effort to rock your customers’ worlds through the effective use of social media will pay off for your business, here’s how! Business owners find SEO (Search Engine Optimization) to be the most daunting digital marketing tactic to take on. By fostering a social media following, providing content that will likely be shared, and interacting with its consumers online, businesses are able to climb the ranks in search engines. If you research you topics and write interesting content that provides value, you will generate an engaged audience. Social Media Marketing has multiple avenues to communicate from and once you understand how they all work and which will suit your business best, learn how to handle them and other factors such as SEO, reviews, and more will provide the ROI you want. If you have any questions about Social Media Marketing, feel free to contact Preferred Digital Solutions.